The Summer Holidays are finally here and thousands of Parents are looking forward to ditch the early morning chaos aka the school run and swap it for lots of fun days out and of course going taking the family on holiday. This year we decided to take the plunge and book a (much cheaper) term time Holiday to Majorca which isn’t until middle of September but we are already looking forward to it. So i thought it will let you in into my Top 10 must have Holiday products when travelling abroad! Dave who blogs over at The DADventure thinks the same! Because our holiday resort is called Pirate Village there is no doubt my little Pirate Finn will want to learn about the Pirates and their Shenanigans before heading to the resort so this Usborne Pirate Activity Book is ideal to take along for him to make the time on the plane go quicker and its wipe clean so it can be done plenty of times! Number 3 on my list is my trusted Babyzen Yoyo which is my last pushchair which i have been lustering after ever since it came out on the market. I have the 2015 model but the new and improved 2016 model called yoyo+ comes with carseat adapters and larger basket! I never looked back since i bit the bullet and got myself a preloved yoyo earlier this year it makes our airport journeys so much easier and the massive selling point for me was that its compact enough to be taken on as hand luggage which means A.) it wont be thrown around by the baggage handlers and i can use it right after i leave the plane! Now its onto the car seats i know in other European countries there are no restrictions regarding having to use a car seat on a coach or taxi but i rather be safe then sorry so after a lot of researching i came across the very lightweight Joie Elevate which is a Class 1/2/3 Carseat and with its weight only being 5.47kg (which is even lighter then my Yoyo Pushchair!) you will have no problem transporting it to the airport shuttle, coach or taxi when travelling abroad! Its loaded with comfort (fully ventilated mesh sides) and fantastic extras including a integrated cup holder . Its suitable from 9-36kg has a height adjustable head rest, side impact protection to assure maximal safeness for your precious cargo! Having had another Joie Carseat for Finn for a few years now i love how easy it is to remove all the covers and give them a wash! when we have friends driving with us to come to ours for a play date. easily deflates and packs away small into your hand luggage on your plane. It has a added belt positioning clip for extra comfort and inflates in less then 20 seconds!! If you want to hear more about my reasons why i am taking car seats for both my children abroad you can read more in my recently publish post: “Family Travelling Tips – Taking Carseats Abroad!”. Now when you finally made it through the airport, plane journey, passport control and coach to your resort its all about, relaxing, sunning and jumping in the pool or exploring the ocean! When you go on holiday and your luggage allowance is limited you are trying to take as little as possible with you but with these Trunki PaddlePacks you don’t have to worry about weight and space because they fold super small and are made out of very lightweight & water resistant material which makes it perfect to throw in the kids water toys (see below) and swimming costumes/hats without having to worry that it will soak through in your beach bag! 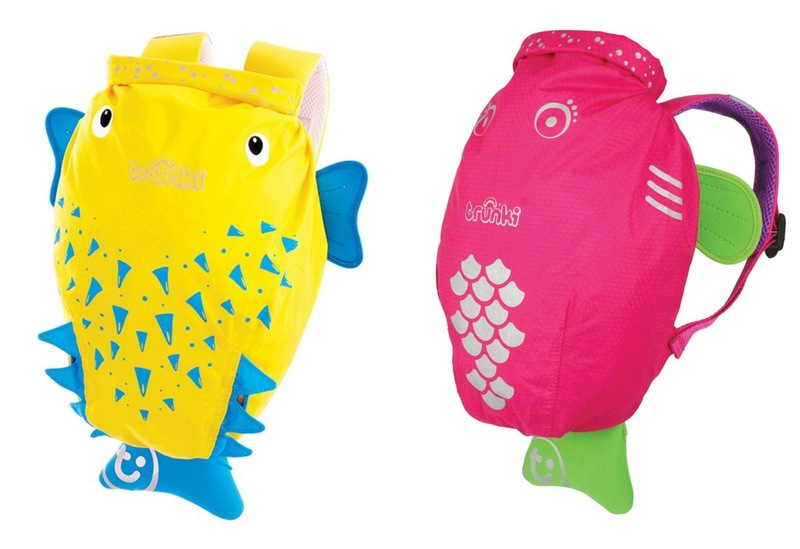 And with their super cute design the kids will love wearing their backpacks themselves up to the room! Finn has got Spike the Blowfish and i recently found a bargain Flo the Pink Fish for MM to take along. Normally both kids have a backpack with some of their favourite plane toys/magazines etc when we fly abroad but this time i will just use the Trunki paddle packs so i safe myself bringing along more stuff! When its finally time to hit the pool these Zoggs Seal flips are a great game designed to encourage children and build confidence in the water. You just blow the seal to make his head flip and due to them lightweight and small there the perfect water toy to take on holiday. MM is currently using them in the bath and loves them! For Finn i am taking some diving rocket sticks to encourage him to dive down to retrieve them, with their colourful designed there are a hit with Finn and he is always taking them to the local swimming pool when he goes with his dad! 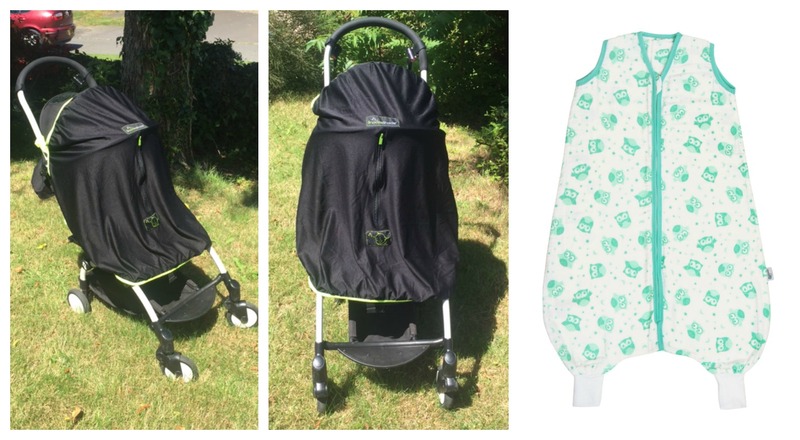 Keeping the sun away from your little ones is always a big talking point when visiting hot countries so i will take along my trusted Original Snoozeshade for my Yoyo to keep Molly-May cool when she decides to have a little siesta through the day! loved the freedom of running around in her sleeping bag. Now you might wonder why i would bring a sleeping bag on holiday with me but for me its a very straightforward reason. Most Hotels abroad do have air con and for me putting Molly-May into just a short sleeved body is a no go because it will get to chilly for her as soon as she kicks off those covers so the Muslin Sleeping Bag will not only give me a piece of mind that she is covered up at night but its also loose enough for her to move around in her sleep! Pssst: if you want a good nights sleep for your little one grab my 15% off to get your very own Slumbersac with Feet just use the code “SBL04″ (valid until 19th August 2016)! Poncho version large enough for Finn. 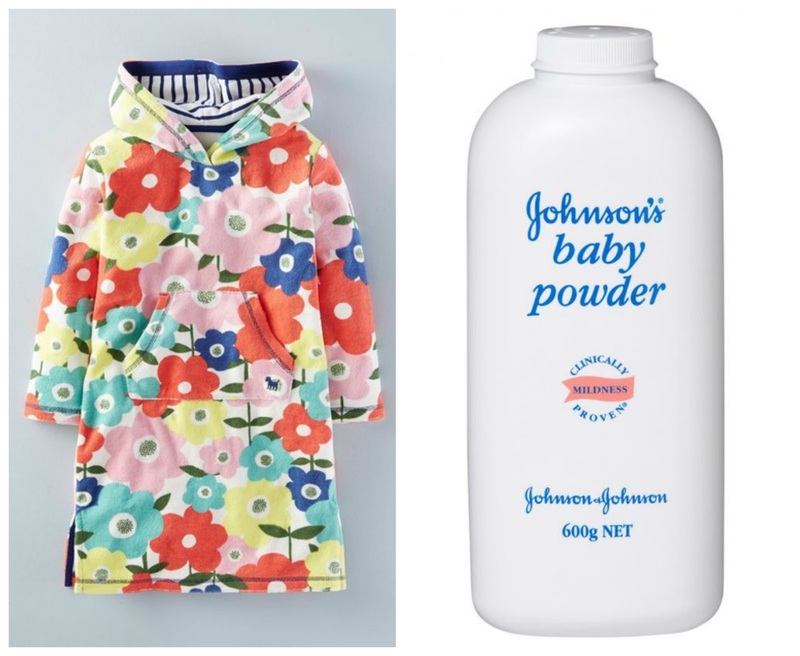 A Product which didn’t make it into my Top 10 but still gets a mention is the century old Baby Talc, now believe me i was as stunned as you are right now reading this but Steph who blogs at Hello Baby let me in on a little secret and such a simple one as well! If you put some Baby Talc on the Feet of your child it will remove the stubborn sand straight away and you can slip those Sandals back on your clean and sand free feet! 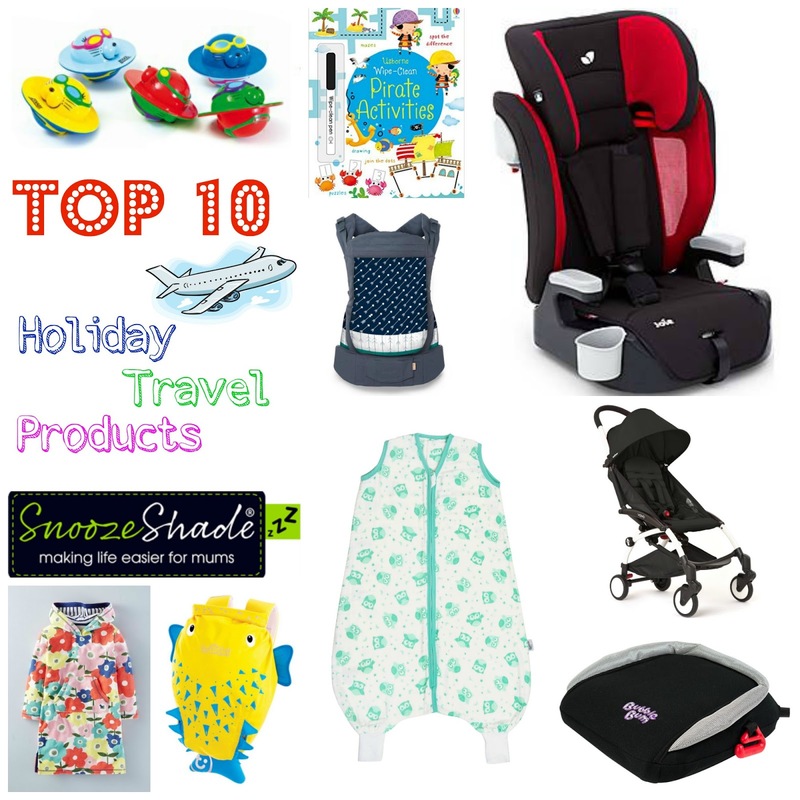 That is all from me and My Top 10 Holiday Travelling Products! I hope you all have a amazing Summer and a great holiday wherever you will go! Disclaimer: Some products listed on My Top 10 Holiday Travelling Products have been send out to me for reviewing purposes, but all thoughts and opinions are mine. Fab list and all very useful, I loved my SnoozeShade!